New report by the Negev Coexistence Forum (NCF) presents new figures about house demolitions in the Negev. The report, based on enforcement authorities’ data, reveals the ways in which the state utilizes enforcement in order to displace citizens from their lands. The NCF will publish a new report – Enforcing Distress: House Demolition Policy in the Bedouin Community in the Negev – on Thursday. The report focuses on the house demolition policy, presents new figures from recent years, reviews the different enforcement authorities, the ways they operate and the legal framework for this policy. The report reveals that over the last three years, more than 50% of the structures were demolished by their owners, not by the state. This is a trend that the Southern Directorate of Land Law Enforcement is promoting, by pressuring the citizens through frequent visits by policemen and inspectors. 70 of the structures demolished in 2015 and 140 in 2014, were demolished without a demolition order. Inspectors of the National Unit for Building Inspection managed to push about 210 house owners to demolish homes on their own, under the threat that if they won’t do it, a demolition order will be issued against them. The Southern Directorate warns on its annual report that: “It is a clear fact that the gap continues between the rate of enforcement and the rate of housing solutions offered by the state”. As Israel’s State Comptroller protested in his last report, Israel acts in the Negev without a clear regularization or enforcement policy. The report reveals that even the enforcement authorities warn that the state does not provide solutions for citizens whose houses are demolished, yet continues to pursue the house demolition policy. The Bedouin community is more than 34% of the area’s population, yet only 18 settlements out of 144 are designated for this community. The State of Israel is firm in its refusal to recognize the unrecognized Bedouin villages in the Negev, and use house demolitions to pressure their residents to negotiate and give up the land they claim as their own. The Southern Directorate is employing a policy of “enforcement to promote regularization” – in which planning and construction laws are utilized to displace Bedouin citizens from their homes. The report exposes many cases in which the Southern Directorate describes the pressure it puts on citizens – the Bedouin Authority asks them to join negotiations, then whoever is not willing to negotiate is served with demolition orders. According to the Southern Directorate, after a demolition file is open, many people tend to yield and enter negotiations. The Israeli Police refuses to share the Yoav Unit budget, claiming that it will “jeopardize the security of the state”. 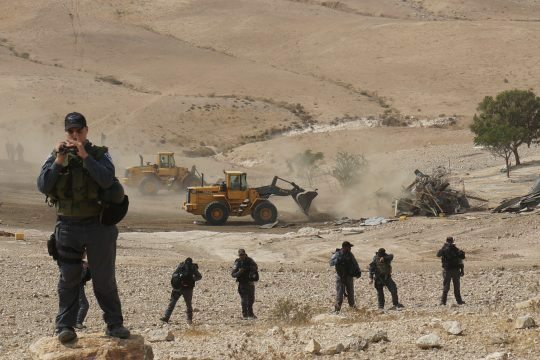 The Yoav Unit, a police paramilitary force that escorts enforcement authorities during house demolitions in the Negev, was established as part of the Prawer Plan. Even though the Prawer Plan was shelved,the unit still operates. NCF issued a freedom of information request to receive the Yoav’s full budget, yet only the amount of vehicles and their costs were revealed. The Yoav Unit includes about 200 policemen, and 44 vehicles that cost NIS 10,371,000 (USD 2,670,000). Haia Noach, NCF’s executive director: “The state of Israel keeps on disregarding the severe housing distress of the Bedouin community, even when the enforcement authorities warn about it. Instead of working for the entire Negev population, our government extends the gaps between communities by approving more and more Jewish settlements in the Negev while pushing the Bedouin community into crowded urban towns that cannot receive more residents. The State of Israel should cease the house demolition policy and draw a new, equal policy for recognition and development of Bedouin villages, that will make the entire area bloom”.